VDESK Integrated PTZ & PTX Production Systems include switcher, effects, transitions and Chroma key, with local encoding and streaming functions. 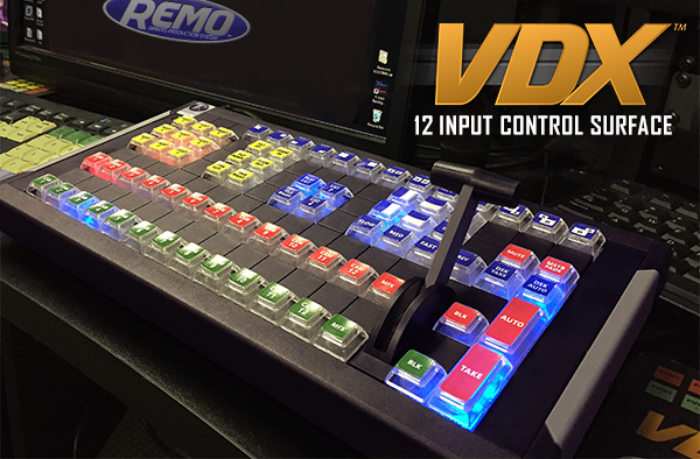 They include 24” touch screens, support 4, 8 or 12 SDI or HDMI inputs, plus NDI and URL inputs and outputs. They Control most PTZ cameras as well as PTX Model 1 and Model 2 pan/tilt heads. REMOTE CONTROL your production from your TABLET! Use your iPad, Android or Windows tablet to control your VDESK over a wireless(N) network. Run the entire show from anywhere in the room. 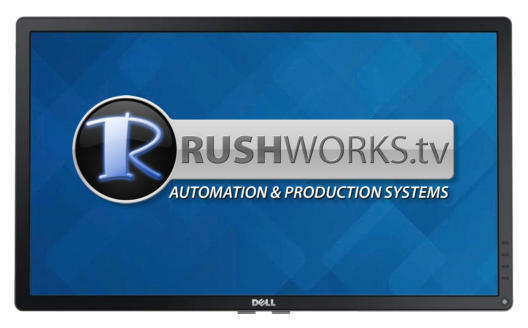 RUSHWORKS is a Dell OEM partner, taking advantage of their great three- year ProSupport plan that provides overnight parts replacement and next day, on-site service if required. VDESK solutions are typically configured in one of three Precision Workstation models: Mini-Tower, Tower, and 2U Rack Mount. Mirrored drives standard (2TB or 4TB). RAID 5 arrays also available. We support Input/Output cards from Blackmagic, Stream Labs and Magewell. You can specify four, eight or 12 inputs. You can also configure inputs to accept NDI streams or URLs via a network connection. The default output card provides simultaneous SDI and HDMI signals, plus NDI, YouTube Live, Facebook Live, and URL outputs. There is an option for dual output SDI with “clean” program feed. Each system includes a 24” touch screen monitor, custom keyboard, mouse and 6-button Hall-effect joystick. (Joystick not included with international shipments) Also available is the optional VDX 12 Input Control Surface. It includes a T-bar for manual transition control, as well as shortcut keys for many transitions and effects, including PiP and double-box. You can also select cameras and individual presets for each. 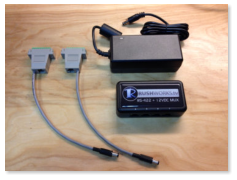 Included is our MUX: a device which connects to the workstation via USB and has four (4) RJ45 connectors that supply 12VDC power and RS-422/232 serial communications for up to four PTZ cameras. For eight or 12 inputs sytems you’ll need two and three MUX boxes, respectively. You’ll need one DEMUX adapter for each serial-controlled PTZ camera. For IP-controlled cameras the MUX/DEMUX is not required. Our PTX Universal PanTilt heads are also controlled using our MUX/DEMUX connections via CAT5 that carries RS422 data to the heads. The RJ45 connects to the DEMUX which then connects to the 9-pin Phoenix connector on the PTX chassis. You can use any combination of PTZ and PTX heads, as well as manned cameras, as inputs to the VDESK (and REMO). The TALLY-LIGHTS system provides an extra dimension of awareness with PTZ cameras that have very small tally indicators, or no indicators at all. We utilize both the Program and Preview tallies that correspond to our current switcher selections. It’s especially useful with our PTX Universal PanTilt heads that are compatible with the Blackmagic MicroStudio 4K camera, and most other cameras that support VISCA, LANC and Panasonic analog remote control. If you’re a VDESK/REMO user and need tally light contact closures, our MULTI-GPIO box provides that functionality based on a simple software configuration setup in the application. 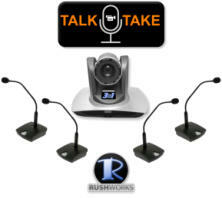 TALK-TAKE is our automated video switching intelligence based on active microphone detection – along with a set of user-definable “rules” for emulating the dynamics of an operator. You can control dozens of mikes by linking multiple mixer chassis. This functionality further enhances the already versatile VDESK and REMO software which includes three unique user interfaces: CLASSIC, PRODUCER and TalkingPoints.